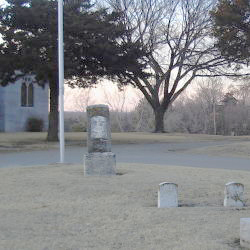 Description: A granite monument and flagpole form the focus of a number of rows of related grave sites. The monument is inscribed: "Our ~ Unknown ~ Dead ~ Are ~ Remembered". Description: The memorial circle in the cemetery includes a number of rows of related grave sites. 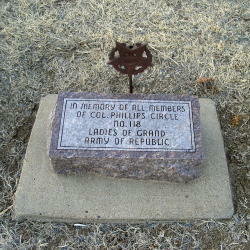 In one row is a monument that is inscribed: "In Memory Of All Members ~ Of Col. Phillips Circle ~ No. 118 ~ Ladies Of Grand ~ Army Of Republic". 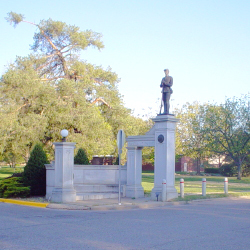 Description: A descriptive plaque is located on the left side of the gateway: "Oakdale Memorial Gateway ~ In 1918 this gateway was erected as a memorial to Civil ~ and Spanish War veterans. The bronze statue on the left ~ is a Union soldier while the one on the right is a Rough ~ Rider. The original gateway was 12 feet apart and included ~ a folding bronze gate. In 1933 the pillars were widened to ~ 33 feet to allow for large vehicles. After a vehicle ~ destroyed part of the left pillar in 1990, it was rebuilt ~ in 1992 at a cost of $70,000. The original cost of the ~ entire gateway was $18,000". The left section of the gateway is inscribed: " In Memory Of The Men ~ Of This Vicinity ~ Who Gave Their Lives To ~ The Defence Of This Country", "Thos. Anderson ~ E.B.Ericson R.R.Dearing ~ County Commissioners". 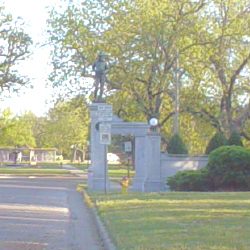 The bronze medallion under the statue reads: "Col. William A. Phillips ~ Founder of Salina Kansas". The right section of the gateway is inscribed: "Dedicated To All Our ~ Loyal Sons Who ~ Showed Distinguished Valor ~ Upon The Nation's Battlefields". A bronze medallion is mounted above the inscription which reads: "Gen. John A. Logan ~ The Black Eagle of Illinois ~ In Honor of John A Logan Post G.A.R." The bronze medallion under the statue reads ; "United Spanish War Veterans ~ 1898 - 1902". 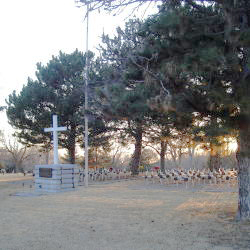 Description: The memorial circle in the cemetery includes a number of rows of related grave sites. 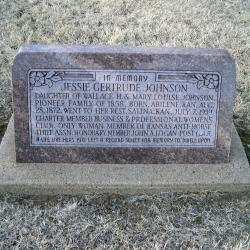 In one row is a monument that is inscribed: "In Memory ~ Jessie Gertrude Johnson ~ Daughter Of Wallace H & Mary Louise Johnson, ~ Pioneer Family Of 1858. Born, Abilene, Kan, Aug ~ 28, 1872. Went To Her Rest, Salina, Kan, July 7, 1939. ~ Charter Member Business & Professional Women's ~ Club. Only Woman Member Of Kansas Anti-Horse ~ Thief Assn. Honorary Member John A. Logan Post G.A.R. ~ A Life Like Hers Has Left A Record Sweet For Memory To Dwell Upon". 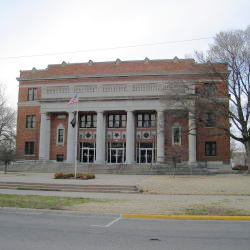 Description: Large bronze plaques are mounted above the doors of the Salina Memorial Hall. From the left, these are: "Spanish War Veterans 1898-1902", "G.A.R. 1861-1865", "American Legion". Description: A bronze plaque on the monument is inscribed: "Flag Flying ~ In Memory of ~ All Veterans". In front of the stone monument is another bronze plaque reading: "Dedicated To The Memory Of Those Who Gave Of ~ Their Lives In Defense Of Liberty For Their Country".